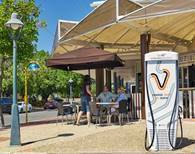 Investment sets Australian charging infrastructure company on track for expansion into USA and Europe. Tritium has closed an AUD$10m capital raise in a record time of just 10 days, from a single investor – prominent Queensland entrepreneur Brian Flannery. This follows an AUD$5m equity raise in March 2017 and an AUD$2.5m investment from the Queensland Government’s recently-launched Business Development Fund, established to support innovative local businesses. Tritium’s capital raises have been led and managed by the St Baker Energy Innovation Fund, which itself was one of the early investors in Tritium in 2013 alongside the Varley Group. Queensland businessman, Brian Flannery, has been watching the development of Tritium and the EV infrastructure sector for some time. “I can see that a tipping point has been reached in this market. Tritium has been at the forefront of innovative development in the fast-charging sector and its sustained growth and future expansion programme has convinced me that this is the right time to invest. “I like the experience of the management and the product they export from Queensland. The fast charger market for EVs is only just emerging both in the home and along the highways. “Suppliers like Tritium, with good products, will lead the market. The fact that it is an Australian-designed product, makes this investment even more attractive to my family investment company”, Flannery said.